So far we have explored the roles and the artifacts of Scrum. From here on, we will be exploring the 5 essential events of Scrum. Let’s start with “The Sprint”. 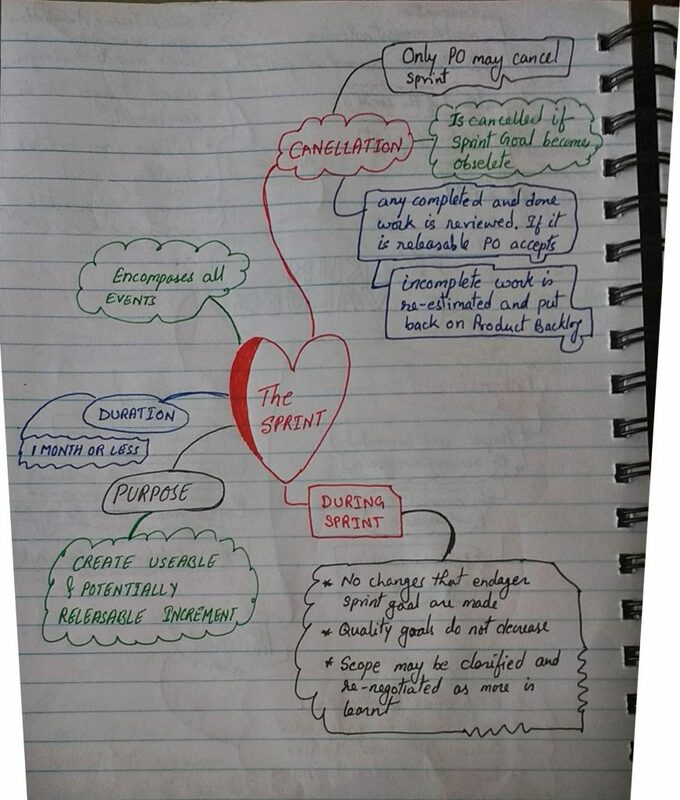 The Sprint is the heart beat of Scrum. It is a time-boxed event; time-boxed to one month or less. During the Sprint the Scrum team works towards creating a “Done”, useable and potentially releasable increment of the product. During the development effort the Sprint length remains consistent. This creates a rhythm; reduces uncertainties and provides the team a feasible horizon where it can focus on the work to be done. This also enables predictability as the team can validate there progress at-least once every calendar month. All the other events i.e. Sprint Planning, Daily Scrum, Sprint Review and Sprint Retrospective happen within the Sprint. A new Sprint starts as soon as the previous Sprint ends. It is like a timeline; there are no breaks in-between. 3. Scope may be clarified and re-negotiated between the Product Owner and Development Team as more is learned. The only purpose of every Sprint is to create a “Done”, useable and potentially releasable increment. The Sprint is time-boxed event; time-boxed to a maximum of one month. However, the length of the Sprint can be varied as needed by the Scrum team (keeping in mind it never lengthier than one month). That means the Sprint length can be shortened as much as needed. How long can the Scrum team stay disconnected from the stakeholders? How often does the market changes in which the product operates? What is the impact of technology trends on the product? How quickly the product needs to go to market? How many times the requirements change? Based on factors like above the Scrum team may decide a sprint length varying from 1 week to 1 month. You may even have a Sprint length of one day (do consider all the overheads, though); but you may never have a sprint whose length exceeds 1 month. One may also make use of the Stacey’s Matrix to identify the length of the Sprint. The more the uncertainties with requirements, technology and people; the shorter the Sprint length should be. As we gain more certainty on requirements, technology and people we may move to longer sprints of 1 month. Once the length of Sprint is decided we do not change it very often or it might disturb the rhythm of the team. A Sprint gets over only when the time-box of the Sprint expires. It may however be cancelled before the time-box is expired. There are few rules, however, for cancellation of a sprint. Only the Product Owner can cancel the sprint. A sprint is cancelled only when the Sprint Goal becomes obsolete. It may be cancelled if continuing with sprint work doesn’t make sense given the current circumstances. Any completed and done work is reviewed. If it is potentially releasable the PO accepts it. All incomplete work is re-estimated and put back on the Product Backlog. The sprint is time-boxed event of one month or less during which a “Done”, useable and potentially releasable increment of product is created. Scrum, Scrum Events, Sprint. Bookmark.